Home » comic books , marvel comics , movie reviews , thor » By Odin's beard! Chris declares that THOR is worthy indeed! By Odin's beard! Chris declares that THOR is worthy indeed! If there are movie theaters in Heaven, then Jack Kirby has to be smiling this week. Because I saw Thor at 12:01 this past Friday morning and the more I think about it the more I find myself believing it to be the best pure comic book superhero movie that I've ever seen. ...and it is one heckuva fun ride! Thor doesn't bother with puny mortal concerns like justifying the reality of science with the mystic wonder of magic. As Thor describes it at one point, his world is one where science and magic are one and the same. Or if you want a more pedestrian explanation: Thor and his people are an alien civilization of overwhelming power and achievement, that we Earthlings can only perceive as magic. I liked that. 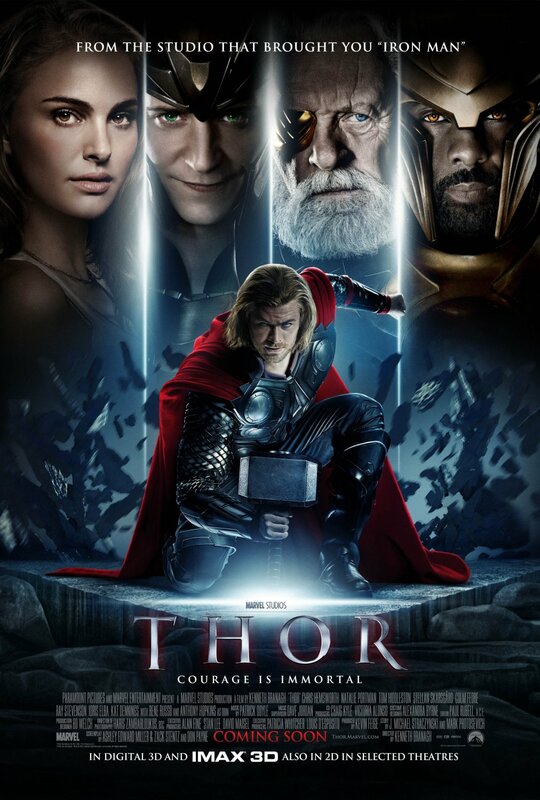 It's what lets a movie like Thor dispense with tedious rationale and get on to the action, action, ACTION! The film's plot - the story comes from Mark Protosevich and J. Michael Straczynski: a man who has no small amount of experience in this sort of thing (he created Babylon 5) - will be gratefully acknowledged by those who have followed Thor in Marvel Comics, while also being readily accessible to those unfamiliar with the character. The movie opens with Thor being thrown down from heaven (literally) and crashing into the New Mexico desert, where he is found by scientist Jane Foster (Natalie Portman), assistant Darcy Lewis (Kat Dennings) and Jane's advisor Dr. Selvig (Stellan Skarsgard). Thinking that this strapping muscular blond guy needs medical attention, Jane and crew ferry the unconscious Thor off to a hospital... and failing to notice the metal hammer that has followed Thor from space. From there we get a glorious synopsis of the world that Thor comes from, courtesy of monologue from Thor's father Odin, the king of Asgard (played magnificently by Sir Anthony Hopkins). We see how the race of Asgardians battled the Frost Giants over a thousand years ago to keep them from conquering the Nine Worlds (of which Midgard - the realm of Earth - is a part). We see Odin taking his young sons Thor and Loki to look at the Casket of Ancient Winters, the source of the Frost Giants' power. The obvious setup is that the Frost Giants will soon (in Asgardian terms if not human) try to take back what was once theirs. That comes several hundreds of years later when Odin is about to proclaim Thor (Hemsworth) King of Asgard with Loki (Tom Hiddleston), Queen Frigga (Rene Russo) and the rest of the royal court witnessing the coronation. The Frost Giants attempt to steal the Casket, they fail... and Thor is perturbed, to put it mildly. So Thor gathers up his posse consisting of Loki, Sif (Jaimie Alexander) and the Warriors Three (Ray Stevenson, Tadanobu Asano and Joshua Dallas). They make their way over the Bifrost Bridge to convince Heimdall (Idris Elba) to open the gate to the Giants' world of Jotunheim so that Thor and company can wage war on Laufey (Colm Feore) and his frigid brethren. Well, Thor wanted battle and that's what he and his compatriots get. But it's not what Odin desires. Thor's daddy shows up, brings the wayward Asgardians back and has some not-so-nice words for Thor. The culmination of Thor's chastisement? The god of thunder is stripped of his powers and his hammer Mjolnir and cast down to Earth. For the next good bit Thor is quite an entertaining "fish out of water" story. Thor knows who he is and he knows where Odin has exiled him to... but that doesn't stop him from making a Nordic spectacle of himself (the line that he tells the pet shop clerk is especially hilarious). But this isn't a story about fallen gods trying to hack it like mortals must: this is Marvel Comics' Thor and it's not long before Loki... who made a discovery about his own heritage during the jaunt to Jotunheim... takes advantage of Odin's fall into the deep Odinsleep in order to claim the throne of Asgard. Sif and the Warriors Three sneak to Earth to find Thor and from that point on magic, mystery, mischief and might are on a honkin' big collision course, culminating in a battle for all creation. Thor is everything of the purest essence of comic bookdom's Silver Age writ large for the silver screen. Some will argue that the film might suffer a bit from a slower mid section, but you know what: I didn't have any particular problem with that. Because Thor at its heart is a story about humility and how one must learn to be humble. When we first see Thor he's brash, headstrong, eager to fight... and those aren't the qualities needed in a king. So we watch Thor learn the hard way that he's not the centerpiece of Asgard, and that a king must govern not so much with power as with wisdom. In that respect Thor might be too rushed for some people... but hey, if you're going to see Thor you're going to watch stuff like Thor fighting the Destroyer, not for Ayn Rand-ish soliloquies about virtue. Chris Hemsworth is spot-on perfect as Thor. Anthony Hopkins brings the requisite weight and gravitas to the role of Odin. But the character that I really wound up digging the most was Tom Hiddleston's Loki. This is a villain who is so not like the stereotypical cartoon bad guy. Indeed: Loki is darn nearly a character that you must feel sympathy toward. It's obvious that beneath it all he loves his father and brother very dearly. This is the kind of complicated emotion that would have been fun to behold in Anakin Skywalker with the Star Wars prequels that we unfortunately didn't get. I can easily imagine that it will be but one more thing that will entice many to see Thor during its first run at the box office. I'll give Thor my highest recommendation possible for a movie, and I'm probably going to catch it again later this week with some more friends. Oh yeah: look for Stan Lee in his most brief (and somehow funniest) cameo yet in a Marvel Comics movie. And don't be so quick to leave the theater: there's a scene after the credits which sets the stage for Thor's return in The Avengers next summer! Would have to agree with you on your assessment of Thor. A well made movie, and well made considering the popularity and history of the book. Not too much humor, not too much romance, just all the hammer slingin' scene chewin' boastfully testosterone filled dialogue thou couldst abide!-- The action scenes! The look of Asgard! The Frost Giants! The Rainbow Bridge and it's enigmatic keeper. The look is fantastic, the effects and story are fantastic, the score eclipses routine background music!-- To see the Destroyer brought to life-- is THE COOLEST! It's family friendly and accessible even if you never picked up the book. Are you likely to you see a better superhero movie this summer? I say thee NAY! Loved the soundtrack. One of the the best action movie scores I've heard. Haven't seen it yet, but I'm ecstatic to. I wish i was able to see that thor movie. Previews looked amazing.